I recently had the opportunity to sit at a round table discussion about health and nutrition. As we sat and talked, one young man gave a very convincing talk about the ketogenic diet and intermittent fasting. As he talked I started to get captivated because his own personal story was great, but then he said something that shook me from my zone and I realized what I had known all along, diets don't work. As I was about to ask some important questions, my phone rang and there was an emergency on the other end that I could not ignore. The opportunity to talk about what was really important was lost. As I chewed on the experience over the next several days I just couldn't ignore the subject and so I decided to discuss it here. In my health coach training we learned to digest the top 100 diets in 10 minutes and the ketogenic diet falls into this as well. All diets manipulate one or all of these 3 areas: timing, macro nutrients, and/or protein source. They all have the science, the research and the testimonies to prove why their diet is the best and why everyone should do it. What no diet company has ever done is followed their clients long term to see how they did after the diet was done. 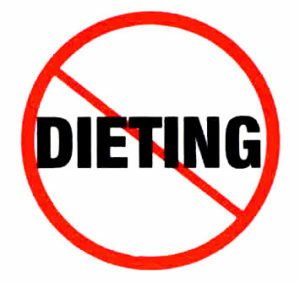 Here's the real statistic, 98% of the people who lose weight through dieting gain the weight back in 6 months. Chew on that for a moment. All the pain and suffering and restricting that someone does to lose the weight and it comes right back. That should be required to put on all diet advertising. Back to the ketogenic diet and intermittent fasting for a moment. If you do the diet, yes, you will lose weight, cut fat and look great...for a moment or until you can't take it any more and you say screw it and go on a binge. Then the cravings will set in and the weight will come back. There are also people who should never try this diet because of health concerns. If you have Crohn's disease, cardiovascular disease, diabetes, chronic fatigue syndrome or any type of skin disease, you should not try the ketogenic diet. Ok, so now what? If I can't or shouldn't diet, what do I do chris? I'm so glad you asked. There are 3 types of eaters. Type 1: healthy eaters, they eat when they are hungry, they stop when they are full and they generally eat healthy without binging on bad food. Type 2: emotional eaters, they eat when they are bored, stressed, happy, sad, and anything in between. Type 3: militant eaters, they are on a very strict regiment and eat to a plan, a guide or a schedule. If they go off track, they will punish themselves by restricting themselves or doing more workouts in the gym to counteract the effects of getting off track. In my health coaching program, I teach my clients to develop healthy eating habits that last so they can lose the weight they desire and keep it off for good. Should you diet? On my opinion, NO!!! Don't let your dream die inside you! I want you to ask yourself these questions right now and if necessary, don't proceed any further until you can answer them with clarity. What is your dream? Do you have a dream that you had as a child to do something significant in this life? Did you let go of that dream and throw it away or stuff it down so deep that you thought it could never happen? Do you want to resurrect that dream and attempt to make it a reality? Thank you for taking time to look within yourself and see that you still have hopes and dreams hidden in that shell. You still have hopes and dreams that you would love to see as a reality in your life. Some times, we may feel like life has passed us by or that we are too old, too weak, too frail, too broke, too whatever the excuse is. Excuses are just what we tell ourselves so we don't have to put in the effort to see if our dreams can become reality. Two years ago, I thought all my hopes and dreams of a grand future were gone forever. I was a wreck and a mess and I saw no hope of every getting back to a place of living a life that I really enjoyed. I was broken and shattered. This was the best place to start to rebuild. I got to have a do over in my life. The rules were gone. The expectations were gone. The canvas was now empty and I could paint on it whatever picture I chose. At that time, I really didn't know what the future held. I just knew that something had to change. I was either going to fail miserably, or succeed amazingly. I started by just getting on my knees and crying out to God and telling him that I was tired of trying to be in control of my life, because I was failing at it. I told him that I would give my life to him and let him shape me in whatever way he wanted. A year prior to that, I said out loud one day, "God, how can I get paid to do something I am really passionate about?" This question was stirring in me and I just couldn't let it go. You see, when I look back at my life, I have done some really amazing things and I have had some great adventures, but most of that was because I chose to do what someone else influenced me to do. I joined the Army National Guard because my stepdad recommended it. I became a medic because my grandma was in healthcare. I became an engineer because my boss kept telling me I had potential and he could see that I'd be good at that. I learned how to be a construction engineer in the army because my ex wife wanted to build a home (at a discount). You see, I was chasing everyone else's dreams and expectations for my life. I finally stopped and asked God how I could do something I really wanted to do. From that day forward, life went downhill fast. My marriage ended, I became a single father, and I was trying desperately to figure out this new way of living. I had to learn to be mom and dad and I had to learn to do what my ex wife was doing for the household. Life was a mess, but I didn't give up. As I started asking God for direction, I spent time in prayer, reading my bible, and watching or listening to ministers who I trusted. Those messages and the word became the inspiration for writing this blog. This blog became the inspiration for me to step out and take chances by faith in what God said in his word about my life. God had a plan for me that was greater than I could have imagined. I set out to find out how I could become a life coach. I set out on a journey to help people who were struggling like I was. I set out to change the world for good in whatever way I could. I eventually found the right school, completed my courseware and have been coaching clients for a few months now. It has been so amazing and rewarding, but that's not all. There is more. Back to my dream. Around 15 years old, I had these day dreams of becoming a public speaker some day. I would think about this and get energized and see this bright and happy future where I was standing on stage motivating people to make positive changes in their lives. I was motivating them to step into who they really could become. I had some significant setbacks in my life shortly after that. I stuffed that dream down inside and thought it was just that, a dream. As I was going through the coaching program, that dream started to come back to the surface and get stronger and stronger. I have since stepped out and started speaking publicly. I have had several speeches to date and I have more on my calendar for next month. I love to motivate people to make positive changes and step into what could be. I love to help them figure out how to make those dreams come true and I love to be there with them as they walk that journey to accomplish what they set out to do. It is so rewarding. I hope this inspired you to go for your dreams. Are you where you want to be or where you expected to be at this point in your life? If not, what are you willing to do about it? The reason that I even started this blog was to inspire you to change the direction of your life if it was heading in the wrong direction. I wanted to share what I was doing to overcome my personal struggles and what I was doing to overcome in life. What happens when we start renewing our mind? Either we get puffed up with knowledge or we take action and change. I want you to have the latter. I want you to be inspired to step up and step into the areas you fear. Philippians 4:13 says I can do all things through Christ which strengthens me and it also says in 2 Timothy 1:7, that God has not given us a spirit of fear, but of power, and of love and of a sound mind. God does not want you to be afraid. He wants you to go out and conquer the world in a good way. He wants you to use your influence to lead others to him. In the past year, my life has undergone a significant shift or transformation because of my relationship with God, his guidance in his word, and renewing my mind, which renewed my belief in myself. He gave me the courage to step out in faith and take action towards some lifelong dreams that I had let go of and thought were gone forever. He gave me the confidence that I could still do what he created me to do and it wasn't too late to try. I stepped out and went back to school to become a life and health coach. I implemented the material I was learning on myself and saw great results in my health, nutrition, finances, relationships, and work performance. After practicing on myself, I took practice clients through the courseware and saw significant changes in them too. They lost weight, got better jobs, got promotions, had relationships repaired, learned how to develop new relationships and developed new habits and new beliefs in themselves. They were transformed too. Today, they have different habits, different beliefs, and different outcomes than they had before. It is amazing what God can do by changing just one life. Will you let him do that for you? I had a childhood dream of becoming a public speaker, yet I was paralyzed to take action. As I continued this journey to change, God worked on me and worked on my self limiting beliefs to eradicate them. As he did that, I got more courage to step out in faith. Tomorrow morning, I will be speaking to a group of 65 employees from our city. I'm excited and feel so blessed that God opened this opportunity for me to live a life that I dreamed about when I was 15. Thank you all for reading my blog. You inspire me to keep writing. I hope to be more consistent in my writing, sharing with all of you what you can do to overcome in this life. There are many examples in the bible of people who were afraid by what they saw. Peter became afraid when he saw the winds and the waves in the story of Jesus walking on the water in Mathew 14:25-31. And the disciples were afraid of the storm in Mark 4:36-41.They were afraid because of the outward circumstances. The waves were big and the wind was blowing and the boat was filling with water. It didn’t look good for them. When they woke Jesus up, he said to the sea “Peace be still!” and the wind ceased and there was a great calm. In verse 40 he asked them why they were fearful and why didn’t they have any faith. God tells us to walk by faith and not by sight, because when we walk by sight, we can lose our heart. We can lose our faith and doubt and unbelief can set in. Doubt and unbelief rob us of the blessing that God has for us. Many times people can believe for a miracle or a change in their life only to give up too soon or to get into fear and unbelief before they get everything they are believing for. I don’t want you to give up and I don’t want you to get into unbelief. When you don’t believe in what God has promised you or you did believe, but then start focusing on your circumstances fear sets in. This blog is about renewing your mind. When you renew your mind with the word of God, you begin to understand that God is for you. He wants the best for your life and he’s not the one causing you all the trouble. If fear sets in, the enemy can take you for everything you have. Sometimes when I have battled fear in the past, I have thought of Job. Job became afraid for what his kids could be doing, so he gave an extra offering to cover the sins they could be doing. He was afraid to lose his kids. In one day, his worse fears came knocking on his door and he lost everything. God eventually restored everything Job lost and gave him more, but what he was afraid of came to pass. Don’t be afraid. If you’re afraid of something now, there is still hope. You can renew your mind and change the direction of the course of your life. You can grow your faith enough to overcome the fear you are facing. Here are some steps you can take. Quote God’s promises over your life daily. Get your eyes off your circumstances and get them on Jesus. Speak to your circumstances and tell them what God said. Here is an example you can use. 1 Corinthians 12:27 Now you [collectively] are Christ’s body, and individually [you are] members of it [each with his own special purpose and function]. Amp. Roman’s 12:21 Do not be overcome and conquered by evil, but overcome evil with good .Amp. 1 John 4:4 Little children (believers, dear ones), you are of God and you belong to Him and have [already] overcome them [the agents of the antichrist]; because He who is in you is greater than he (Satan) who is in the world [of sinful mankind]. Amp. Psalms 23:4 Even though I walk through the [sunless] valley of the shadow of death, I fear no evil, for You are with me; Your rod [to protect] and Your staff [to guide], they comfort and console me. Amp. Isaiah 54:14 You will be firmly established in righteousness: You will be far from [even the thought of] oppression, for you will not fear, And from terror, for it will not come near you. Isaiah 54:17 “No weapon that is formed against you will succeed; and every tongue that raises against you in judgment you will condemn. This [peace, righteousness, security, and triumph over opposition] is the heritage of the servants of the Lord, and this is their vindication from Me,” says the Lord. Amp. Galatians 1:4 Who gave Himself [as a sacrifice to atone] for our sins [to save and sanctify us] so that He might rescue us from this present evil age, in accordance with the will and purpose and plan of our God and Father. Amp. Psalms 91:10, 11 No evil will befall you, nor will any plague come near your tent. For He will command His angels in regard to you, to protect and defend and guard you in all your ways [of obedience and service]. Amp. Proverbs 12:28 In the way of righteousness is life, and in its pathway there is no death [but immortality—eternal life]. Amp. These are just a few of his promises regarding fear and unbelief. When faced with circumstances that don’t look good, focus on God, on Jesus Christ and what he has done for your life. You can't steer a parked car. Too much knowledge puffs one up. When you know a lot, two problems can exist. First, you can get proud or arrogant and need to be right all the time. Second, you can get paralyzed and take no action. I want to focus on the latter today. Since starting this blog, I have gone through a lot of transformation. God has been working on me to get rid of some self limiting beliefs about that weren't serving me and weren't serving him. This was painful sometimes and other times, it was such a relief. I had put myself and God into boxes that I could control and I stopped trusting God to do amazing things in my life. Ok, so how do I go from getting too much knowledge and taking no action to being transformed? I'm glad you asked. For many years in my Christian walk, I went to church, I learned my bible, and I learned what God said about me and what he wanted for me in my life. The problem was, that I did not take action. I was paralyzed because I knew all these things that God wanted me to do, but I wasn't doing any of them. I wasn't taking action. If you take a pitcher of water and pour it into a cup, naturally at some point the excess water spills out and goes everywhere. This is what should naturally happen when we read the bible and follow what God says to do in his word. I was very afraid of people and I was shy. I couldn't tell someone about the love of Jesus because I was stuck. I wasn't taking any actions. I was like the dead sea in Israel. It is fed by the ocean, but it has no outlet, so everything in it is dead. So what happened to change that for me? I got divorced. Besides my relationship with God, my marriage was the one stable thing in my life that I could count on. When that ended, I was lost and I was searching to figure out why. Through the process of getting to the lowest of lows in my life, I broke out of the mold. I started to take action and to change who I thought I was. I decided that inaction was not serving me well at all. This blog started at a time in my life when I was hurting and life looked really terrible from the inside and out. Here's what happened, I knew that God said to go into all the world and preach the Gospel. At that time, I couldn't afford to even drive to the next town to share the Gospel. God gave me the idea to start this blog. It was an action step, a step of faith, but it was ACTION. When I started, I didn't know what to write about. I didn't know if anyone would read it. I didn't know if anyone would even like it, but I finally let go of caring what others thought of me. You see, I have no right to know what you think of me because you don't know me and you may have a skewed view of who you think I am. I could let your opinions stop me from doing what I'm supposed to be doing. I can't let you do that. I just shared this quote on a friends post on Facebook, but I thought it was worth sharing on my coaching page because it’s worth analyzing. God has hidden some of your miracles in the places you are afraid to go. Think about the implications of that statement. How many of you have fears? I do. I’m going to share some with you and those of you who know me well might be surprised. Do some of those ring true with you too? Fear is very real for so many people and it is capable of stopping the the strongest people in their tracks. Here’s what I did to overcome my fears or at least step into them and discover that I can and have overcome them. I just did it. I stepped in and decided that what was on the other side of that fear was worth more than the pain that I felt staying on the safe side of life. I let go of the fact that I couldn’t control how other people viewed me and so, I should just go for it. I should take chances and put myself out there. I’ve had the chance to overcome a lot of the fears in my life and I’m still working on others. I hope this encourages you today to step out of the box called your comfort zone and explore what’s past that edge. What are the consequences of your thoughts? Your on the freeway heading to work. It's rush hour traffic and by now, you've become accustomed to the fact that it's busy, it's slow, it's frustrating and you know what lane you need to be in to get off at your exit. Being on time is very important to you and you know the routine; up at 4:30, hit the gym by 5:00, showered and cleaned up by 6:30, breakfast on the run, hit the parking lot at 7:45, and in our hot seat at work by 8:00 ready to take on the world. Today, someone who isn't a planner, isn't great at planning out their day and isn't great at getting to work on time, realizes they aren't going to make it on time if they don't hurry up. That guy realizes at the last second that they need to cut into your lane to get to the exit on your right and they go for it. This is the moment of truth. What will you do? The event of someone cutting you off in traffic is neither positive or negative. Most would argue that it is negative, but it's really neutral. What is positive or negative are your thoughts. The bible says that as a man thinks in his heart, so is he and out of the abundance of the heart, the mouth speaks. An event triggers thoughts in your head. Sometimes those thoughts can come so fast that the person doesn't even realize that they had them prior to reacting. The University of Pensilvania has done some amazing studies on what they call resiliency. In their studies, they discovered a cycle that occurs when we have reactions to events. They even have been able to determine what someone's thought theme was based on their reaction to the activating event. Let me give you an example. I am a person who says sorry a lot. We could walk up to the same door at the same time and rather than say excuse me and barge my way in, I am likely to say "sorry" and let you go in first. I have been doing this nearly all my life and didn't understand why. When I learned about this process of determining what my thought themes were I discovered that I had a dominant thought theme of "Trespass." The base of the Trespass thought theme is that "I have harmed you or caused you harm." University of Pensilvania discovered what the bible has been saying for thousands of years and did the research to prove it true. What you spend your time thinking about will be revealed in your emotions and reactions. It is very hard for us to see our own blindsides if we are able to see them at all. If you are having trouble in your external environment, in your relationships, in your community, or in your workplace, consider thinking about what your thinking about. Consider picking up a bible and reading God's word to learn how he thinks and to renew your mind so that you can think better thoughts. As you renew your mind, I know you will renew your life. God's word works where the reader applies it. Let me know if this helps you or if you have any questions. Just today, I ran into someone who's playing the intake vs output game and losing. I talked with my friend about his eating habits and he is only eating 1 time each day. As we talked, I could see his logic in making this choice. He has limited activity and is trying to eat according to his output. There are many problems with doing this to his body. I'm going to highlight a few so you can avoid this problem and help set your body up for success. First, our bodies are insanely smarter than we are. They can adapt to ever changing conditions to help keep us alive. When we think we are tricking our bodies into losing weight, we are actually tricking our bodies into slowing our metabolism. When you eat just one time each day, your body has to make the calories from that meal last 24 hours. It slows down your metabolism so that you can make it through the day. Second, this is both harmful for you and not the way that you should lose weight. I talk to a lot of people who struggle to lose weight and many of them are not eating enough food each day. They are tricking their body into slowing their metabolism down and reducing its ability to let go of unwanted weight. The best thing you can do to boost your metabolism is to eat 3 meals each day and make sure you are getting the best quality ingredients each and every meal.